Be Sure to Subscribe to our "Action Team" Email Newsletter. CLICK HERE to sign up. Following are a variety of newsletters, Rotary Foundation Messages and speeches from the Devlyn web site archives. The "E-Express" was the monthly newsletter sent out by President Devlyn during his year as RI President. We have retained the archives for historical purposes. 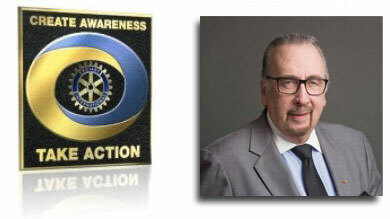 Given to Rotary clubs around the world.